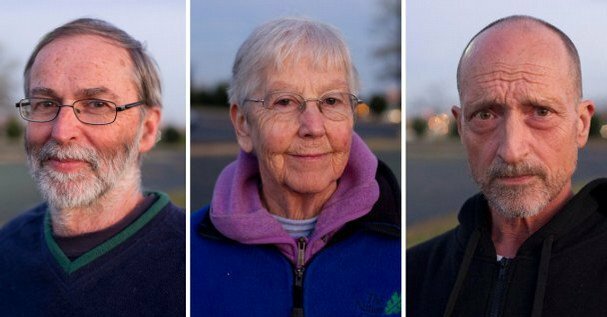 Three peace activists followed by openDemocracy have been released from jail, but their work against nuclear weapons goes on. From left: Greg Boertje-Obed, Sister Megan Rice and Michael Walli. Credit: http://www.commondreams.org/Saul Young/News Sentinel. All rights reserved. “Sabotage of the national defense.” That was Judge Amal Thapar’s ruling when three peace protestors entered the Y-12 nuclear weapons facility in Oak Ridge, Tennessee, and daubed biblical slogans on the walls. Thapar handed down his judgment in May of 2013, and sentenced Greg Boertje-Obed, Sister Megan Rice and Michael Walli to prison terms of three to five years each. Two years and eight days after their incarceration, the Y-12 Three—otherwise known as the “Transform Now Plowshares” or simply “MGM” after their first name initials—were released from jail when the US Sixth Circuit Court of Appeals reversed their sabotage conviction. A second charge of “depredation of government property” is still pending, but prosecutors have said that they won’t press for re-imprisonment when the case comes up again in September. This constant concern for others and the health of the wider struggle has been a common feature of the Y-12 Three’s beliefs and actions both in and out of prison. In August of 2015 I spoke to each of them about their experiences. Walli is living in the Dorothy Day Catholic Worker House in Washington DC, where he’s been a resident on and off since 1987. Rice is in the same city, living with other members of her religious order, the Society of the Holy Child Jesus. And Boertje-Obed has returned to his home in Duluth, Minnesota, another Catholic Worker House that was started by his wife Michelle. Boertje-Obed had no warning at all. “At three o’clock a guard said ‘come with me to the superintendent’s office.’ He didn’t say what for, but you usually go there if you’re in trouble.” Instead he was offered a phone call to his wife and a one-way bus ticket to Knoxville (the wrong destination due to a mix-up by the prison bureaucracy), from where he found his way back to Duluth with the help of his friends. Rice had the same reaction: “I felt so badly for the other prisoners who were my friends. It’s very difficult spending time doing what I’m doing now while knowing that they are still in jail, when they deserve to be on the clemency list just as much as I do.” For her and the other two protestors, these relationships of love and solidarity—grounded in the vision of a compassionate creator—give them enormous inner strength and confidence. “It’s based on inner voices like Gandhi or the Quakers. In moments of quiet you will hear messages of what to do. Of course you have to test these voices by consulting with others and reflecting on the values of what would be ‘good’—your inner voice isn’t God if it’s going to cause harm to other people. So when we are preparing for a Ploughshares [peace] action we go to great lengths to ensure that people don’t feel threatened and aren’t hurt in any way. Support from the outside also helped. “We had never acted in Tennessee before,” Boertje-Obed continued, “but there was a great outpouring of support from people locally including around the Y-12 complex, which is a little surprising since so many of them work and make their livelihoods there.” “They are the people,” added Rice, “who know why the plant has to be transformed, and that much more life giving and sustaining alternatives are available. “Before [prison] you were not a credible person to speak about the nuclear situation as well as prison conditions,” Rice concluded, “but now I’m certainly feeling that there’s a wider interest in the message of our action, and that has really energized and exhilarated me. How could there ever be one superpower on this shared planet? It has to be about the common good. St Thomas Aquinas and most other prophets through history have seen the same guiding vision of harmony and balance that is patterned in nature.